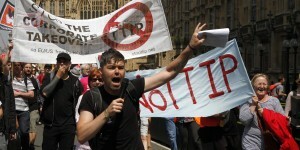 12/07/2014 – Protestors against the EU-US trade deal (TTIP) outside the Houses of Parliament, London. The following piece was originally published in Serbian at Masina.rs. The Transatlantic Trade and Investment Partnership (TTIP) is a free trade agreement that will soon be signed between the United States and the European Union. According to the website of the European Commission (EC), this agreement ‘removes custom duties’ and ‘barriers to investment’, which allegedly impede trade between the US and EU. However, as the US already has agreements on the abolition of custom duties with the majority of countries with which it trades, and as the very existence of the EU was founded on such agreements, the ‘barriers’ mentioned by the EC can in no way be related to customs. Rather, if we look at the agreement, what the TTIP identifies as ‘barriers’ to trade are actually the very bases of social protection: from labor laws to social security and pensions. Contrary to the way it is represented by the EC, the agreement does not contain any kind of proposals for the opening of work places nor the raising of standards of living. What’s more, contrary to its very own description, this is not a standard free trade agreement, but rather an expansion of the principle of competition that will cut through all previously-established agreements. Since the terms of the agreement will be validated on a global level, its consequences will be felt both by citizens of Serbia and of all the other countries which are not signatories – in coping with this new competition in a ‘race to the bottom.’ When the ‘obstacles’ are removed and rights eliminated, nation states and their economies will easily be sacrificed under the pressure of integration into the world market. How did the TTIP come about? The TTIP was brought about by a concert of European and American lobbyists of the EC and American Congress. In the case of the USA, this was initiated by the ‘Trans-Atlantic Business Dialogue,’ which had moved similar agreements such as NAFTA and TPP (about which more will be said later). In the case of the EU, it was the so-called European Round Table of Industrialists, which includes such well-known names as Vodafone, L’Oréal, Nestlé, Heineken, Siemens, etc. Negotiations began in July 2013 and, as was the case with the NAFTA, TPP and ACTA agreements, have taken place without public scrutiny. However, despite the absence of transparency, this agreement is being rushed ahead: owing to political conditions, its conception must be concluded in the fastest possible time. Since the negotiations are taking place at the level of the European lobbies-EC and the American lobbies-Congress-Obama’s administration, the dynamics of the agreement dictate their relations, which means that according to all estimates the agreement must be signed before the presidential elections in the US this year. Unlike standard free trade agreements, the TTIP introduces a series of structural novelties at a global level. Since it does not abolish trade, but rather the so-called ‘regulatory’ barriers to it, its consequences will be most greatly felt in the regions which fall in the scope of these barriers – the public sector, standards of protection and workers’ rights. In addition, the TTIP also envisions the founding of a body which will be charged with the task of ‘removing the barriers’ after the end of negotiations, without democratic controls or the supervision of trade unions. In the case of the public sector, it introduces a so-called ‘negative list approach’, which means that all public services and all parts of the public sector will be able to be sold, that is, privatized, unless they are specifically listed as exceptions. This de facto means the forcible opening of new markets: the opening of the public sector, state institutions, and even public procurements for transnational competition. Moreover, as TTIP will be valid not only for present but also all future institutions, the authorities are even opening up to the world market those services that have yet to be introduced. This delimits the ability of governments to regulate their own non-profit sectors and public services, such as health and education or water supply. At the same time, changes are being introduced to the protections of food standards (lifting the ban on GMO), of health, the environment and all other fields of protection. Since the USA and EU drastically differ in their approaches to protective standards, the TTIP will have to create a system of parallel standards in which both sides will have to “select” which protections will be maintained and which set aside. However, as the agreement provides for the possibility of further changes or removals to these standards not only during the process of negotiation but also following its signing, the future of protective standards will be left up to the mercy of the market economy. The questions of standards simultaneously concerns workers’ rights: as, according to the TTIP, workers who begin business relations with a foreign firm will not be granted the possibility of collective agreements, nor the same rights or the assistance of trade unions. Likewise, unlike the majority of free trade agreements, the TTIP does not provide for any sanctions against the violation of labor rights. Other sections set out the requirements for the abolition of banking regulations in all the signatory countries, the abolition of agricultural subsidies, the intensification of the protection of intellectual property (where there is the possibility for including parts of the ACTA agreement, which has not been signed), while simultaneously weakening the protections of digital privacy, etc. One of the novelties of the TTIP that has provoked the most extensive reaction is the so-called Investor-State Dispute Settlement (ISDS) – a mechanism for resolving disputes between foreign investors and states. ISDS is a form of legal regulation which, on the one hand, gives investors the ‘rank’ of a state in the case of legal disputes – such that they would be able to initiate legal proceedings and receive judgements in their favor. And on the other hand, since the signatories of the agreement are not the investors themselves but actual states, investors can neither be in violation of its conditions nor can they be sued by states – in this sense, the ISDS elevates investors above the state, ,. The core of this system is the establishment of ad hoc international arbitration tribunals, which would be convened for every separate dispute; these tribunals would be composed of business lawyers without experience in public service. The significance of these courts is reinforced by the fact that the agreement gives to investors the right to bypass all lower instances of local courts of the states which they sue and to directly request the establishment of an arbitrary tribunal through the ISDS mechanism. Moreover, because of the new definition given to the term ‘investment’, which the TTIP introduces, investors will be able to sue states even in cases in which there do not exist any kind of explicitly signed agreements between them. 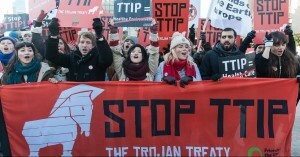 Given that the TTIP evidences practices similar to those introduced in the US by the NAFTA (chapter 11) and Energy Charter Treaty, the consequences of such agreements are not unpredictable: following their signing in the 1980s, there was a spike in the number of lawsuits brought and their abuse. This is the reason that the introduction of the same system on a global scale has provoked a rebellion of international lawyers who have brought into question their impartiality with regard to the composition and role of the court. Similarly, due to pressure from within the EU, the EC decided in the course of negotiations to ‘reject’ this mechanism and suggest a ‘new’ one. Unlike the ISDS system, it would be public and subject to annual reviews. In the meantime, the EC has in the same breath decided to begin the process of establishing a public investment judicial system at the international level, which would not be ad hoc but have a lasting and proactive character, and would be in effect for all future disputes between investors and states. Quite contrary to the EU’s ‘rejection,’ therefore, the legacy of the ISDS is not abolished, but, rather, secured for the future. The question of investment is a central point of the TTIP. In Chapter 2, section A, already we find a new definition of investment has been introduced: ‘Investment means every asset that an investor owns or controls, directly or indirectly, that has the characteristics of an investment, including such characteristics as the commitment of capital or other resources, the expectation of gain or profit, or the assumption of risk.’ In this sense, by the term ‘investment’ will now be meant not only the investment of fiscal or financial resources but also their very possibility — in the form of ‘expectations’ or ‘commitments’ (actually promises), or the ‘assumptions’ which an investor ‘adopts’ at the time of the agreement. If we take into account the fact that the same agreement also envisions the foundation of the afore-mentioned international arbitration courts, then this means that those companies protected by the TTIP will be able to sue states if they lose not only the existing, but even the potential means, that is the presumed profit which was not realized. In the same chapter we find one more unusual item; once privatized, a public enterprise will not be able to be returned to public hands as the agreement introduces a ban on nationalizations (article 11.7). Of course, this process of nationalization rarely happens – almost never in neoliberal states – which moves us to inquire about the sense of its inclusion in such a clause of the agreement. Moreover, if the public sector has already been marked for sale by other measures within the same agreement, what purpose does it serve to ban the very possibility of its removal from private hands? The answer is just this: through the abolition of the possibility of any other kind of property (for example, state-owned or – in the case of the former Yugoslav countries – socially-owned), this agreement will cement any kind of structural changes in the existing societies in the future. As the expansion of private property is the precondition for the expansion of trade, the agreement will not be able to function if this expansion does not come about. Far from a meaningless supplement, this is a key part of the agreement, which will determine the future of every socio-economic struggle from here on. Despite the explanations offered by the EC and its representatives the introduction of the agreement cannot be accounted for from the perspective of a simple ‘fair trade’ logic. On the contrary, this agreement directly concerns the international position of the European market economy as a whole: its signing cannot be understood without having in mind the background of the very composition of the EU and the processes of its integration. For example, in the EU there exists the so-called precautionary principle, which means that if there is a suspicion that a company’s products are harmful to the health or welfare of EU citizens, that company must withdraw its products from the market and, at its own expense, prove before a court that its products are safe, or disprove allegations that they are harmful. In the USA a completely contrary system prevails: in the case of suspicion of the harmfulness of a product, the state or plaintiff must prove, at their own expense, that the product is in fact harmful, and it is only after the judgement that they may be removed from the market. 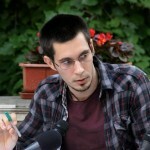 Aleksandar Matković (1988) is a Serbian theorist and political activist, dealing mainly with contemporary Marxism and the political economy of fascism, the history of Yugoslav self-management and theories of biopolitics. He currently works as a researcher at the Institute for Philosophy and Social Theory at the University of Belgrade and is completing his PhD studies in philosophy at the Slovenian Academy of Arts and Sciences in Ljubljana. He is member of the Editorial Committee of the Encyclopédie internationale de l’autogestion and editorial board of the Serbian journal “Stvar”. http://www.pressprogress.ca/5_times_canada_got_sued_under_nafta_for_trying_to_protect_its_environment / – Under NAFTA, Canada was sued and lost hundreds of millions of dollars. The European health, environment, social laws are living their last days, canceled not by some evil dictatorship, but by a trade agreement. Auri sacra fames.